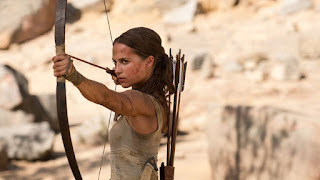 An adventure thriller based on the video game series, Tomb Raider reboots the franchise with an athletic and grounded heroine, but cannot escape the drudgery of silly CGI overload. In London, Lara Croft (Alicia Vikander) works as a bike courier and dabbles in mixed martial arts. She refuses to accept that her father Richard (Dominic West) is dead, although the wealthy businessman and adventurer disappeared seven years ago. Richard was on a quest to find the grave of Queen Himiko, an ancient ruler with enormous evil powers, supposedly buried on a remote island in dangerous waters off the coast of eastern Asia. Lara finds her father's hidden research chamber and travels to Hong Kong, where she teams up with boat owner Lu Ren (Daniel Wu) and they set sail to the island of Yamatai in the Devil's Sea. They wreck on the rocky shores of the island, and stumble upon a well-financed expedition led by the evil Vogel (Walton Goggins). He is intent on finding Himiko's grave to benefit the shadowy Trinity organization. With the video game series rebooted in 2013, the movie franchise follows with this effort, directed by Road Uthaug. Tomb Raider is an origins story with a focus on the relationship between Lara and her father, and the first 30 minutes work well. Alicia Vikander brings a vulnerable sincerity to the role, and Lara is introduced as a compelling central character struggling to define her place in the world and resisting the idea that her father is gone forever. Once Lara arrives in Hong Kong both Uthaug and the film start to lose their way. An endless and needless chase scene with some nondescript goons along the ramshackle waterfront is quickly followed by the arrival of messy CGI as Lara and Lu Re wreck their boat in the middle of a nighttime storm. By the time Vogel is introduced as a traditional heartless and psychotic villain, Tomb Raider is relegated to the ranks of countless mindless action films, the characters confined to the back row well behind the special effects, ridiculous stunts and mind-numbing escapes from death, which arrive at the rate of one per 3.5 minutes. Vikander's good work is wasted, her athleticism often diverted towards surviving punching bag duties. The two hours feel like three as Himiko's grave site is finally penetrated, triggering a tired rehash of sequential trap dodging ideas dating back to early Indiana Jones and Mummy days. Tomb Raider opens the creaky crypt door with some optimism, but is quickly sucked into the same old rot.